Super funky this time around. I love it! 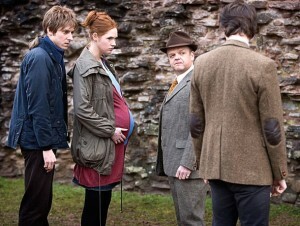 Is Amy knocked up or is everyone on the TARDIS still careening through time and space. Songbirds birds chirping. Back inside the TARDIS. 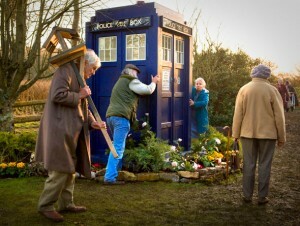 The TARDIS stops working. Back into the real world. The Doctor finds the old folks home and comes to the conclusion that the situation needs to be poked and off he and Rory run. Inside the old folks home the Doctor confronts Ms Poggit and tells her she is really old. Songbirds chirping. Back into the TARDIS. The “Dream Lord” presents the crew with the dilemma that they face. Two worlds, one real one not, two life threatening events, one real one not. The guys get to figure it out. Songbirds chirping. Back to the old folks home; but where have all the old people gone? Songbirds birds chirping. Back to the TARDIS. Amy and Rory have a spat about getting married or staying with the Doctor. The first life threatening event, a star that is burning COLD. Songbirds chirping. The piles of dust are the children that were playing. The old people are actually an ancient alien race, the Eknodine. They were driven from their home by a neighboring enemy many years ago and now feel that they can do it to another race of people. One eye in the mouth of the old people that spews a green cloud spells a pile of dust. The Doctor is chased by the old folks when the Songbirds chirping starts again so he locks himself into a cold storage room in a butchers shop. All the while the Dream Lord is inviting the old people in to get the sleeping Doctor. Songbirds chirping. The crew has to make a decision to determine which world is real. The Dream Lord keeps Amy in the TARDIS world and the Doctor along with Rory hear Songbirds chirping and return to the EARTH world. Amy confronts the Dream Lord. The Dream Lord gives Amy a choice, the Doctor and his adventure world or Rory and a calm, settled world. Switch back to EARTH world. The Dream Lord taunts the Doctor as he races around in a VW fan rescuing people from the old folks. Amy wakes back up in the EARTH world. The Doctor arrives and Amy goes into labor. Rory is green clouded by the one-eyed aliens and turns to dust in front of Amy. Amy decides right then that the EARTH world has to be the fake world and she is determined to die and find out. She truly loves and misses Rory. Amy gets in the VW van with the Doctor and drives the van into the house. Back into TARDIS world. Everything is frozen. EVERYONE wakes up in this world. The TARDIS world is the real world and the Dream Lord admits defeat in the “game”. He leaves. The Doctor determines quickly that the Dream Lord had everyone really deciding between 2 dream worlds, so the Doctor blows up the TARDIS to free them from the TARDIS dreamworld. Success, they all are back in the real world in the TARDIS. The Doctor explains that a bit of psychic pollen from the Candle Meadows of Karass Don Slava had gotten into the TARDIS and it altered their perception of reality. The Dream Lord was actually an incarnation of the bad side of the Doctor brought on by the psychic pollen. Amy then has to explain to Rory how she knew that the EARTH world was a dream too. Amy didn’t really know the EARTH world was a dream, she just couldn’t bare to be without Rory. Rory and Amy are back in love with each other and they are off again. The destination this time is “Amy’s choice”. Just as the Doctor is setting the TARDIS he notices, for a second, a reflection on the TARDIS console and it is not his likeness, but the likeness of the Dream Lord. The new Doctor Who series with Steven Moffat at the helm and Matt Smith as the Doctor and Karen Gillam as the newest companion is one of the most spectacular seasons of Doctor Who so far. I can not wait to see the twist and turns ion the story that develop over the rest of the season! Posted: 06|6|10 at 7:21 am. Filed under: Enemies, New Doctor Who.